New Zealand’s celebrated trout and salmon fishing heritage comes comprehensively alive for the ﬁrst time at the hands of two painstaking researchers, anglers John Parsons and Bryn Hammond. This collection of 375 excerpts from the published works of 132 authors amounts to well over 200,000 words — words illuminating the New Zealand trout and salmon ﬁshing experience from its beginnings in Britain and America in the late 1800s right up to the present day. The editors made their ﬁnal choice of practical, humorous, nostalgic, lyrical, scientiﬁc, and historical writing with great difﬁculty: the book they really wanted publishing ran to an unwieldy 400,000 words. Advised to shorten the book considerably, they did so, with great reluctance. Their nonetheless very substantial final selection accordingly rates very highly indeed. 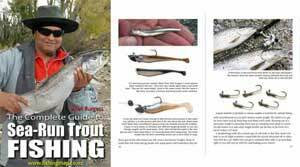 The text is divided into 29 chapters devoted to a full range of anglers’ interests, from monster ﬁsh to artiﬁcial flies, paraphernalia to running waters, opening days to seasons of the year, and so on. New Zealand writers predominate, but excerpts from the works of many overseas writers are embodied. Appended is the first full bibliography of New Zealand angling literature ever attempted (339 titles), a list of relevant periodicals past and present, and brief biographies of certain authors. Complementing the writing are 20 ﬁne colour plates by Parsons (a professional photographer) and more than 100 historic and contemporary black and white photographs and illustrations. 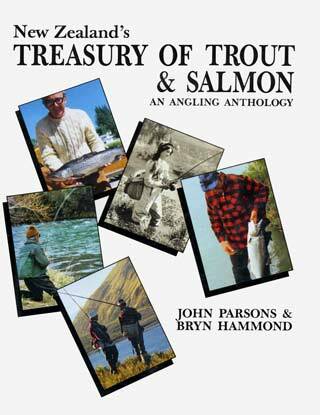 This anthology will stay the deﬁnitive work in its ﬁeld for many years because of Parsons’ and Hammond’s blend of enthusiasm and exhaustive research, and the hours of study and discussion given to the hundreds of excerpts and illustrations from the angling source-books in their own collections. This book will completely satisfy the angler curious about the origins and spread of his sport; the angler seeking fascinating reading; and the angler anxious to explore an absorbing new world of books and writers on a favourite subject. in its ﬁeld, was also published by Halcyon last year. Cover photography courtesy of Nick Bradford, Simon Dickie Adventures, Auckland Weekly News, Bill Crawford and John Parsons. and writing, and as much of his free time as possible to the joys of trout. Although Bryn Hammond was born in Britain and did not come to live permanently in Taupo until early 1981 he had more than forty years of close association with New Zealand in his seafaring and in occasional years of living here. By chance he chose to live ﬁve minutes away from John Parsons who was later to invite him to collaborate in this anthology. Thereafter the joint research and preparation occupied much of his waking and dreaming time. It turned out to be a voyage of discovery full of delights and revelations. Like his co-editor, Bryn Hammond is a passionate angler and bibliophile, as well as being a regular contributor to ﬁshing magazines. Although temporarily back in Britain he maintains close links with New Zealand and New Zealand ﬁshing.